In the first half of this month, Mizoram faced one of the worst natural disasters involving floods and landslides killing 12 persons and destroying hundreds of houses, crops, and infrastructure, cutting off roads, water supply, and electricity. Incessant rains since 9th June culminated into worst floods and landslides. 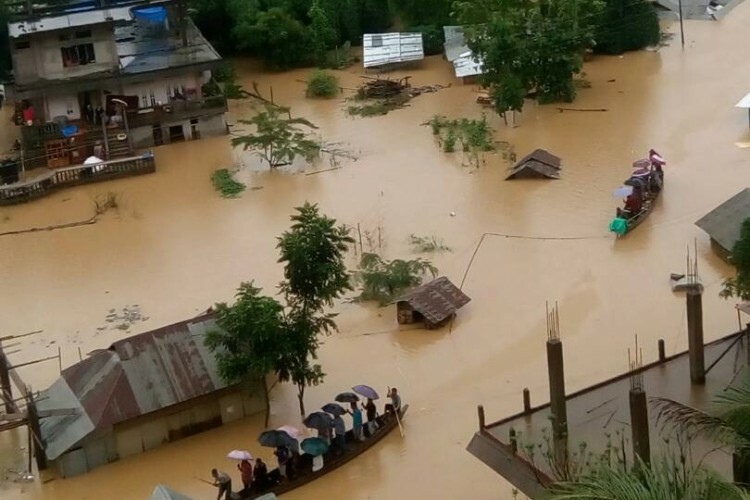 Hundreds of houses were submerged in Lunglei, Lawn laid and Aizawl district and the entire State was affected by landslides. While Sarang in Aizawl district was badly affected by floods and some buildings collapsed in Aizawl, nature’s fury was the most brutal in western and southern parts of Mizoram, mainly inhabited by Chakma minorities. The people are still struggling to come to terms but there is no assistance from the State. But nine days have elapsed since the setting up of the High-Level Committee but there is no sight of any official efforts in the rescue and rehabilitation. It is not the state government but the local community organizations which are leading the efforts. On 18th June, the state Disaster Management and Rehabilitation Department stated that at least 12 persons (10 in Lunglei district, one person each in Aizawl and Serchhip districts) were killed and 877 buildings were destroyed in Mizoram due to landslide and flood since 9th June. As per the Disaster Management and Rehabilitation Department, only 165 houses were destroyed and 299 houses damaged by landslide, mudslide, and flood in Lunglei, and 51 houses were destroyed in Lawngtlai district. This shows that the state government does not have the accurate figures of damaged in the natural calamity. As per the preliminary survey conducted by The aPolitical, as of 21st June, a total of 1107 houses were damaged and two schools were swept away in Lunglei and Lawngtlai districts. This is, however, only a partial list as The aPolitical could not obtain information from several villages in these districts and therefore the actual extent of damages could be much higher. In addition to destruction to dwelling houses, Jhum land, fish ponds, wet rice cultivation areas have been destroyed. The victims have lost all or most of the household properties, paddy and other food items, livestock etc. The flood water has now receded but the victims are living in dire situations without basic facilities like dwelling houses, adequate food, baby food, drinking water, clothes etc. It has been almost 10 days now since the tragedy struck but there is no sight of any government relief efforts in the western and southern parts of Mizoram. On 20thJune, the SDO (Civil) of Tlabung accompanied the local MLA Mr. Nihar Kanti Chakma on the visit to some of the affected villages along the Khawthlangtuipui river (Karnafuli river) within the Tlabung subdivision in Lunglei district. But so far no relief material has been provided by the government. The local MLA Mr. NK Chakma has provided rice and silpaulin covers to the affected families on personal capacity as the elected representatives within his assembly constituency. In the absence of any government efforts, the Young Chakma Association having a network in all the Chakma-inhabited villages has been leading the community efforts of providing relief and reconstruction of damaged houses and clearing or cleaning of the roads. “Now since the water level has receded, we can see devastation everywhere. Because all the water bodies have been polluted, there are high chances of diarrhea epidemic and these areas are very prone to malaria, skin diseases and other diseases. As of now, there is no sight of any medical team or any kind of efforts from the government to provide immediate relief to quell hunger or preventing diseases”, stated a volunteer of Young Chakma Association over the phone from Nunsury. YCA Tuichawng Zone President Ramesh Chakma informed The aPolitical that they have recovered two dead bodies who drowned in the flood waters. “At least 15 gardens/jhum cultivations have been destroyed by water or landslides in Tuichawng and another 30 gardens have been affected at Sugurobasora village,” stated Mr. Ramesh Chakma. He also stated that the YCA Zonal Office at Tuichawng which is a public property was damaged by a landslide. In Marpara South village in Lunglei district, three children were killed when their house was buried in a mudslide at midnight of 12th June and at least 10 houses were submerged. YCA Marpara Zone President Soimber Chakma stated that the devastation could have been higher had the YCA not taken immediate rescue operations. “YCA volunteers removed all household items from those houses before getting submerged, so the victims could save some valuable properties,” informed Mr. Soimber Chakma. After the mudslide, the Marpara villagers under the guidance of YCA undertook a massive search operation for two days and dug out two bodies but could not locate the other one. Among the worst hit villages are those situated on the banks of Khawthlangtuipui river (Karnafuli river) and Thega River in Lunglei district. Since last Sunday the YCA volunteers in Nunsury Zone led by president Manzu Dewan have been engaged in the reconstruction of houses, cleaning and clearing of roads and providing relief materials in Nunsury and other nearby villages. However, the reconstruction efforts have been hampered by inclement weather. At Kamala Bagan hamlet, near Demagiri, at least 67 houses have been damaged by the floods. While most of the families have taken shelter with their relatives or fellow villagers whose houses are in good condition, at least 7 Chakma families are living in tents without basic necessities. They don’t have safe drinkable water or enough food to eat. The school was also washed away and children have no school to attend. “There are destructions everywhere. There is a limit to what YCA volunteers can do because the YCA itself does not have enough funds. We heard that the government will provide compensation and relief materials but as of now only the respective Village Council Presidents have been asked to submit reports about the damages to properties and it could take 3-4 months before the government provides any relief. So, the question is how will the affected people who have lost everything survive all these days?” a social worker asked. Clearly, the State government has sought to abdicate its responsibility to the NGOs and left the natural calamity victims to fend for themselves. This is true across the affected areas in Lunglei and Lawngtlai district. Your share could be as good as a donation for Mizoram Chakmas! Not everyone can afford to take care of their loved ones. Mizoram Chakmas's life can only be saved by donations made by kind people like you.